In a small sauce pan, add olive oil and garlic over low heat. Sprinkle in the salt and make sure to move that garlic around, so it doesn’t burn. Pour the cans of tomato sauce, and 1 can filled with water. Toss in the Italian seasoning and simmer until pasta is ready. Boil that pasta according to instructions on the box/bag. 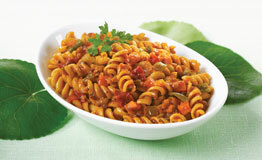 Combine pasta with sauce and serve!